The majority of the 172 outlets identified by Pew Research were founded during and after the recent recession, a period in which traditional media outlets have been losing reporting resources. Many of these outlets (46%) were launched at the height of the recession in 2008 and 2009. Another quarter (25%) started since then (2010-2012), while the rest (29%) were founded before 2008. Most of the younger outlets are not seeking to replace or replicate newspapers or other traditional news media, but rather to fill certain gaps. In the survey, one nonprofit outlet described its editorial mission as "filling the holes that chain media outlets swerve around." The majority of outlets limit their reporting efforts to a state (38%), a city (29%) or a smaller community or neighborhood (8%). Many of them are clustered around big population centers and the coasts. 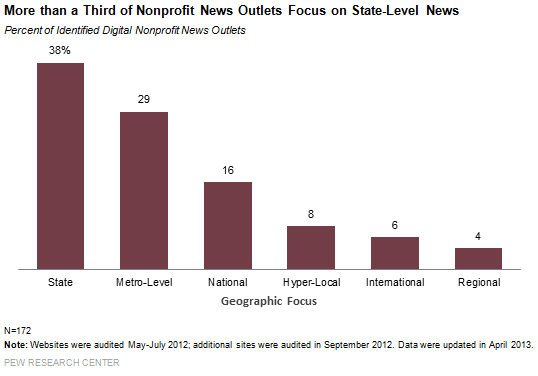 Still, all but nine states have at least one nonprofit news organization, according to the Pew Research audit. In contrast to legacy media, particularly newspapers and television outlets, most of the nonprofits studied have niche orientations-they focus on one topic or type of reporting. Only 26% of the 172 nonprofits cover general interest news. The bulk of them focus on narrower topics to fill one particular gap or another. The most prevalent of these niche areas, at 21%, is investigative reporting, which aims to fulfill the time-honored watchdog role of the news media. Other niche areas include government, health, education and the environment. So what do these outlets produce? To get a sense of the kinds of content nonprofit news outlets create, researchers examined the websites over a two-week period, tallying the number of stories published. Researchers looked for several types of content, including straight news accounts, long-form and investigative pieces, opinion articles, and non-text items such as videos or databases. Straight news accounts-stories that tended to be 500 words or less and focused on breaking events-were the most common, though not near the level of production at traditional news outlets. Close to half of the outlets (47%) published between one and 10 of these straight news stories over the two-week period studied. About a third (32%) published at least 11 news stories, an indication that they are populating their sites with new content on roughly a daily basis. Still, 21% of the sites did not produce any of these shorter, straight news accounts (and instead, in most cases, produced at least one of the other types of content studied). Long-form journalism stories, which contain some deeper reporting or analysis and tend to be more than 1,000 words long, appeared even less frequently. In the two-week period, about two-thirds (63%) of the outlets did not produce a single long-form piece; 30% produced between one and five long-form pieces, and 8% produced more than five. Of the 64 outlets that produced at least some long-form content over the two-week sample period, 10 did not produce any shorter, straightforward news accounts. Opinion and commentary is clearly not a part of the main mission of these nonprofits. An overwhelming majority-77%-produced no opinion pieces during this time period; 17% produced between one and five, and 6% produced more than five. This is different than the measure of ideology in the earlier 2011 report which was identified in the reported news stories through the range of viewpoints represented in stories, themes in the coverage, and the individuals or institutions that were targeted in investigative pieces. Also rare was non-text journalism. 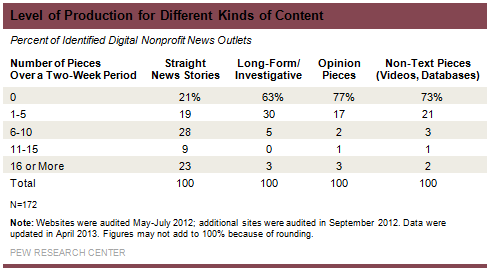 Only about a quarter (27%) of the outlets studied posted non-text pieces such as databases or video on their site. When it came to overall editorial output, many nonprofits produced a modest level of stories and commentary, far less than in traditional news organizations. Indeed, the website audit found that close to half (44%) of the nonprofit outlets examined produced 10 or fewer pieces of original content in the two-week period studied. The nonprofit journalism field is fairly diverse. Many outlets operate independently, funded by grants from major charitable organizations such as the John S. and James L. Knight Foundation or the Robert R. McCormick Foundation, as well as a wide array of major donors and members. Others are sponsored by colleges and universities. Some are affiliated with think tanks or nonprofit advocacy organizations. 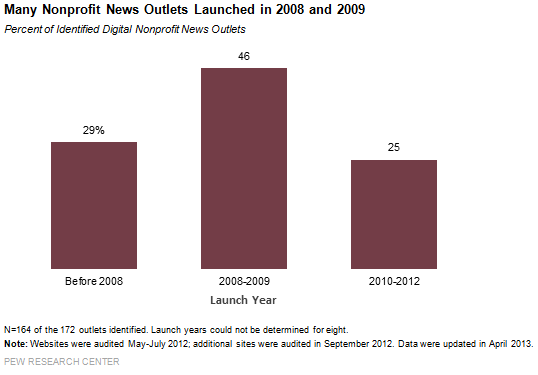 A 2011 study by Pew Research identified several networks of nonprofit news outlets operated by a centralized publisher with a distinct political orientation. One of these, a group of state-based Watchdog.org websites, is operated by the Franklin Center for Government & Public Integrity. The Franklin Center does not disclose its donors, but was launched with the help of the Sam Adams Alliance, which seeks to "increase public awareness of free-market principles and policies." These sites have grown in number since 2011, when Pew Research identified 12 such sites. For this study, Pew Research identified and studied 17 active Franklin Center-sponsored outlets. Another network of state-based websites, the American Independent News Network (AINN), "emphasizes the positive role of democratically elected government." It was found to be somewhat more transparent than the Franklin Center network but just as politically oriented in its content. This network seems to have downsized from nine identified AINN outlets in 2011 to just three identified and studied here. A third network of sites identified in 2011, the Statehouse News Network, seems to have largely dissolved, though some of the outlets in that network live on. The majority of the sites included in the Pew Research survey, especially the younger ones, are still building audiences. Fully 79% of the 93 participating outlets reported their online audiences had grown over the previous 12 months. And a quarter of them said the growth had been dramatic-up more than 75% from the year before. Just 8% said their audience had declined. Predictably, newer organizations were somewhat more likely to see audience growth than older ones: More than 80% of the outlets launched in 2008 or later (46 out of 56 sites) said their audience had grown in the year before the survey, compared with two-thirds (eight out of 12) of those that started before 2000. The staffs of most outlets are quite small. Staffing figures obtained through the survey revealed that about three-quarters of the 93 responding organizations have no more than five paid, full-time staffers for everything from editorial to administration to business duties-and one-quarter have none at all. Only 8% of the sites have more than 10 paid, full-time employees and just 6% (six in all) have more than 25. To a great extent, it is the older and more established outlets that have built up the larger staffs. Of the eight outlets that have more than 10 paid, full-time employees, seven of them were launched in 2007 or earlier. All but the largest nonprofit staffs are dwarfed by most of the nation’s daily newspapers. The 1,386 daily print newspapers in the United States employed an average of 29 journalists full time in 2011, according to an annual census performed by the American Society of News Editors. That is down from an average of 39 in 2001, when more journalists were employed at newspapers than at any other time in the past two decades, according to ASNE. 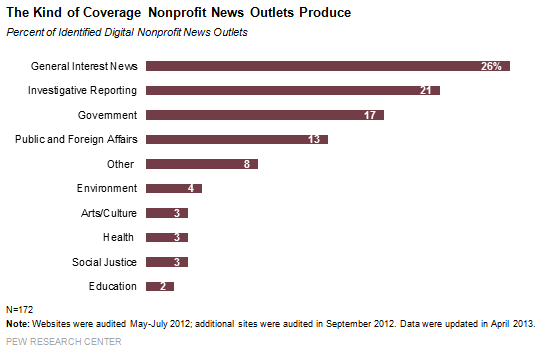 But it still outpaces nearly all of these nonprofit news outlets. And at mid-size city papers with circulations between 100,001 and 250,000, the average rises to 124 full-time journalists. Part-time employees are also a part of the mix for nonprofits, though they tend to still be small in number. A little more than half of the nonprofits have between one and five paid, part-time employees, and 15% have six or more. Twenty-three percent have none at all. In most cases, outlets that have part-time staff also have full-time employees. Volunteer staff is as common across these organizations as paid staff and in many cases outnumber them. Nearly three-quarters (71%) use unpaid volunteers, interns or contributors-typically five or fewer. But 15% of the sites surveyed use more than 25. Volunteer staff is most prevalent among sites without any paid staff. Of the 24 organizations that have no paid, full-time employees, 22 report using unpaid volunteers or contributors. 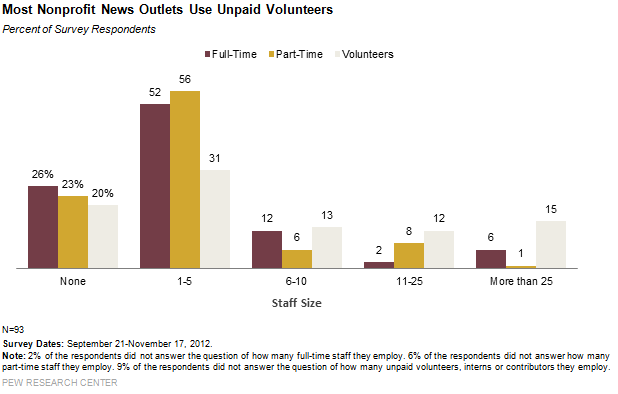 But, still, four of the eight outlets surveyed with more than 10 full-time staff members also use unpaid help. Many of these organizations expressed optimism about enlarging, or at least maintaining, their staffs in the near future. About nine out of 10 expect to maintain their staff size (48%) or increase it (40%) in the next 12 months. Only 10% said they would have to trim their staffs. Yet, as the section on business-side challenges explains, having staff and figuring out the best way to employ them can be two very different things. In March of 2013, analysts returned to these websites to account for any changes that might have occurred. Most of the sites were still publishing new material on a frequent basis. Fully 83% of the outlets studied had published new content within the previous 14 days. The digital nonprofit journalism space is ever in flux. Since the period of analysis, the number of active Watchdog.org sites is likely to have changed somewhat.